“This Land.” That’s the title of the new show. Nice title. Conjuring the song, of course: This land is YOUR land, and MY land. It’s OUR land. Is it? Before it was ours, it was THEIRS, right? It belonged to the Native Americans. Or is it the case that they are a part of the “us” that’s implied in the “our”? Would they even want to be? Included in the term, that is? For that matter, would they say the land “belonged” to them? Often Native American people have chosen instead to remind us that the land belongs to no one. We belong to it, if we are lucky. There, then, is the second reason it makes a good title. Because when you forget about the song, you come back around to a second, more important meaning. Namely, the land itself. THIS LAND. Period. Independent of whoever happens to be walking on it at some given moment. This land. Land: one of those words so fundamental, so ur, it has always been itself. Follow it back through the languages, back to Old High German and Old Norse, further even, it stays itself, it barely changes. Oh, maybe the “a” turns into an “o”: Lond. The earth we stand on. This land. That’s where the work of G. Sanford McGee begins. But we mustn’t forget, it’s also THIS land. Middle Tennessee. The Cumberland Plateau. The land around Sewanee. And the specific piece of land where he lives, near Mitchell Cove, on a communally owned 1250 acres where he has lived and made art for more than a quarter-century. It used to belong to moonshiners. Before that hunters from Mississippian tribes marked the rocks with red symbols. Pictographs. Up in the highlands. On the karst: that means caves and waterfalls. Sinkholes. Coves. Limestone bluffs (“escarpment”). Also, the covering forest. Also, in places, the fields and sky. I have watched him now for 25 years, working from the land. He does so in a literal way, as anyone knows who has even a passing familiarity with his work. He takes sheets of copper—the only metal, incidentally (as far as I am aware), that the Native American artists of his region used—and he places natural forms on top of them. The forms come from the land, from that land. They are objects and organisms. Sticks and leaves. Mushrooms. Flowers. Plants. Sometimes insects. Seeds. Whatever the earth puts forth, he incorporates. Then he leaves the copper out, exposed to the elements. For a long time, months. The sun and the rain do their work. They make time-lapse fossils. Sun silhouettes. Some of McGee’s work reminds me of early photography, the very early stuff, before they even called it photography, back at the end of the 18th century, Thomas Wedgwood’s early attempt, the heliographs, the ones that couldn’t last, that do not survive. That tradition is among the veins McGee’s tapping and mining. For some years, a decade-plus, he tended to end the process there. He’d cut and shape the copper—framing it with walnut that was “locally sourced” (from the land)—but mainly leave the pictures alone. They looked etched by the elements. They were stark, two-toned. There was just the natural color of the copper and the color that occurred where the copper had been changed, where it had reacted to the acid and the light. In places, around the edges, there would be a third shade, the green of patina, the verdigris. I have a few pieces from that period hanging in my house. I miss that land, and they have it in them. Funny word, verdigris. One would assume that the “gris,” pronounced like gree, means green, somehow. But it doesn’t at all. The “verd” is the green. Vert: the French word for green. The “gris” here (which, to make things more confusing, is the French word for gray), actually means “Greece.” So, it’s the Vert de Grèce. The green of Greece. The Grecian green. That’s where the modern Europeans knew it from, that color—from the old, much-eroded classical statues. A tricky name that seems to obscure and enfold itself. “Nature loves to hide,” said Heraclitus. I am reminded of a symbol that McGee identifies with, and that I identify with him: the Green Man, the medieval character who often peeks out at us from the corners of old English churches. A wild creature with vines and branches growing from its mouth and nostrils. A vegetable person. People argue about what it symbolized. Our oneness with nature? Rebirth in springtime? Chaos and madness? Or nothing, pure decoration? During the past four or five years, McGee’s works have begun to change. He has become a better chemist, more skilled with the admixtures and glazes. The simplest way to describe the result would be to say that the pieces have become colorful. Which might be accurate enough. There are blues and yellows and rust-reds. Even some purple. There are new greens, other greens. But this is to describe only the surface—that is, the most obviously visible sign—of a more meaningful evolution. What the pieces have become is painting. He is painting with nature. 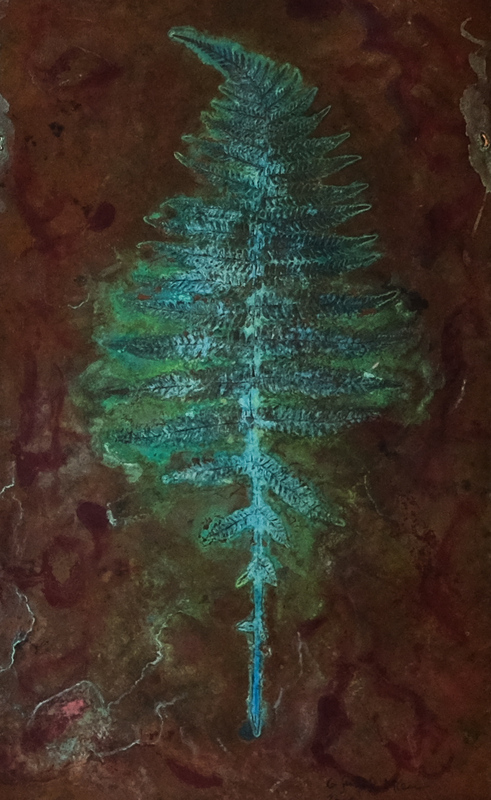 He has wrapped himself and the artist’s brush back into the chemical process, like green vanishing into verdigris. These new pieces have seemingly been done not atop or over the old work, but from within it. Not layered on, in other words, but revealed. These are still lifes that have developed in the pan. They have something quiet to say about the whole dance of nature and delineator. They have emerged from this land, as if they had always been there and the rain finally exposed them.